Business Management Chapter 1.7-1.10 Cameron Stow. 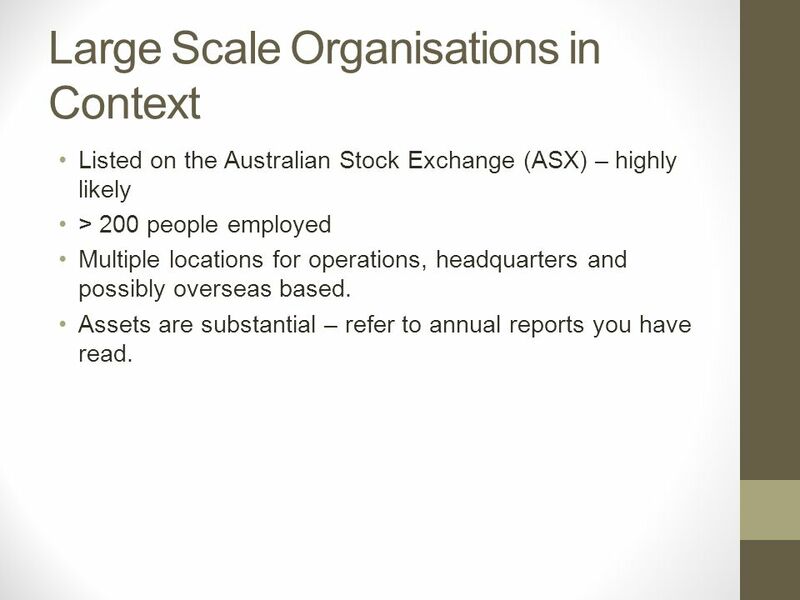 2 Large Scale Organisations in Context Listed on the Australian Stock Exchange (ASX) – highly likely > 200 people employed Multiple locations for operations, headquarters and possibly overseas based. Assets are substantial – refer to annual reports you have read. 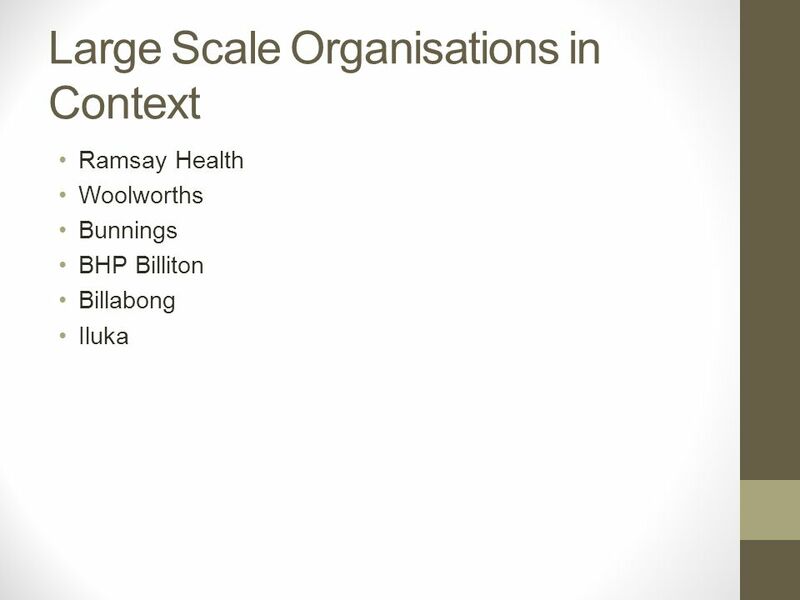 6 Large Scale Organisations Know the difference between an organisation that is in the PUBLIC SECTOR and one that is in the PRIVATE SECTOR. 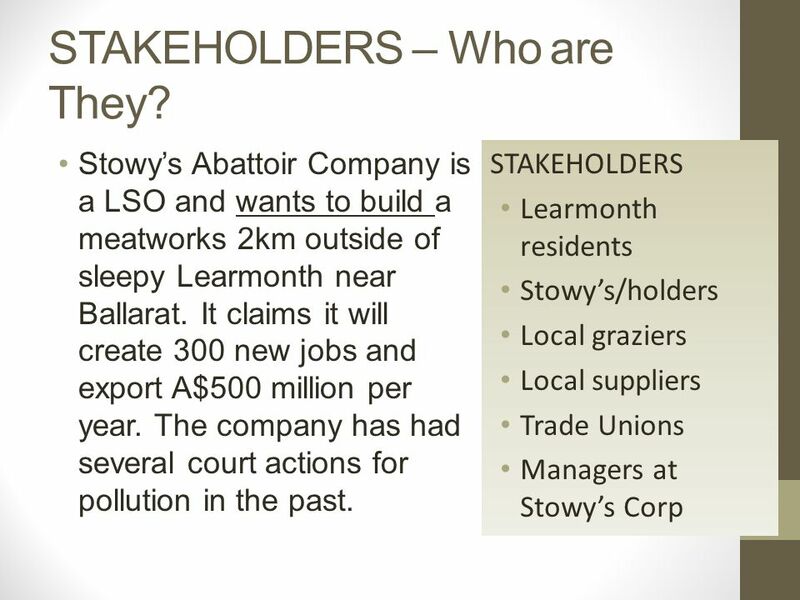 Stakeholders?????? Who are they? There has always been an examination question that asks about these people or organisations. 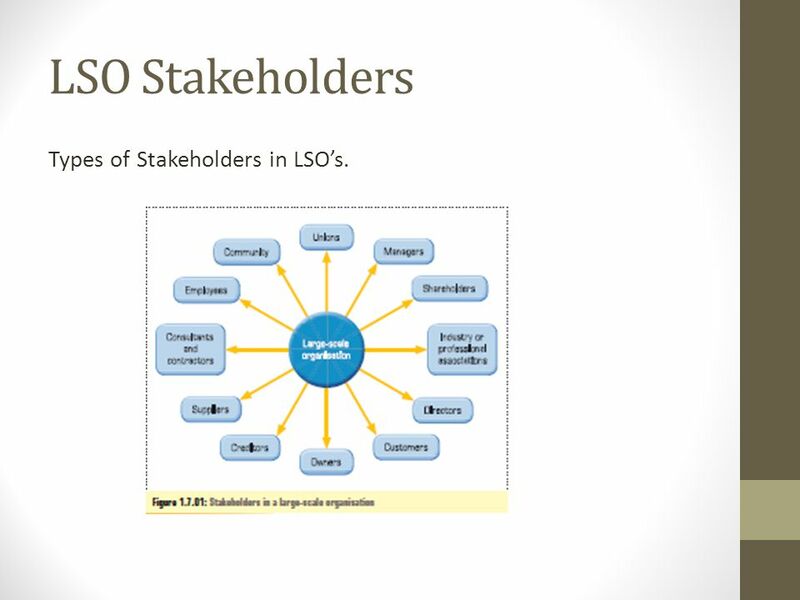 7 LSO Stakeholders Types of Stakeholders in LSO’s. 8 STAKEHOLDERS Those that have an interest in an organisation. 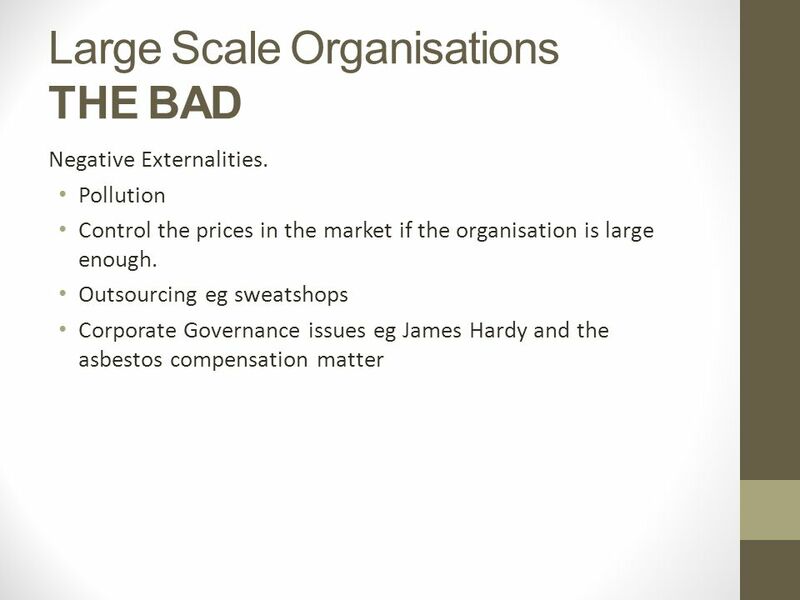 Those that could be affected by decisions made by the large scale organisation. 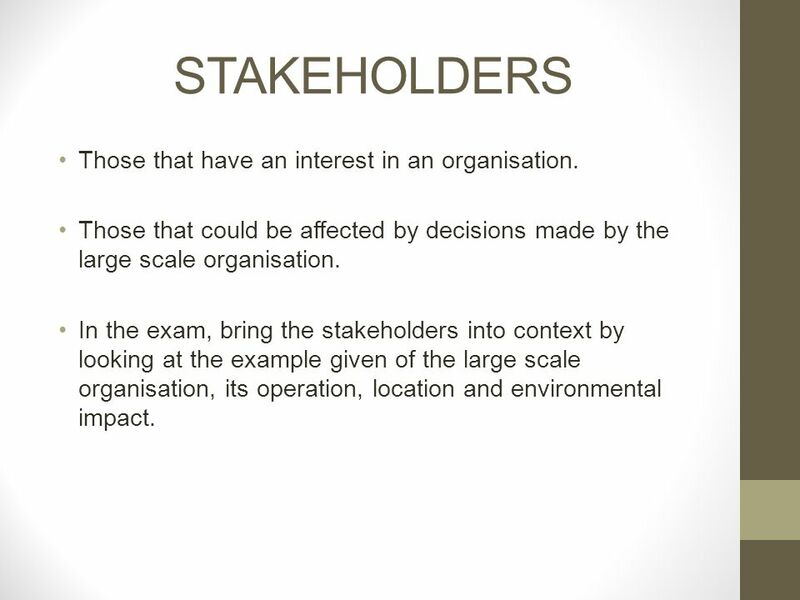 In the exam, bring the stakeholders into context by looking at the example given of the large scale organisation, its operation, location and environmental impact. 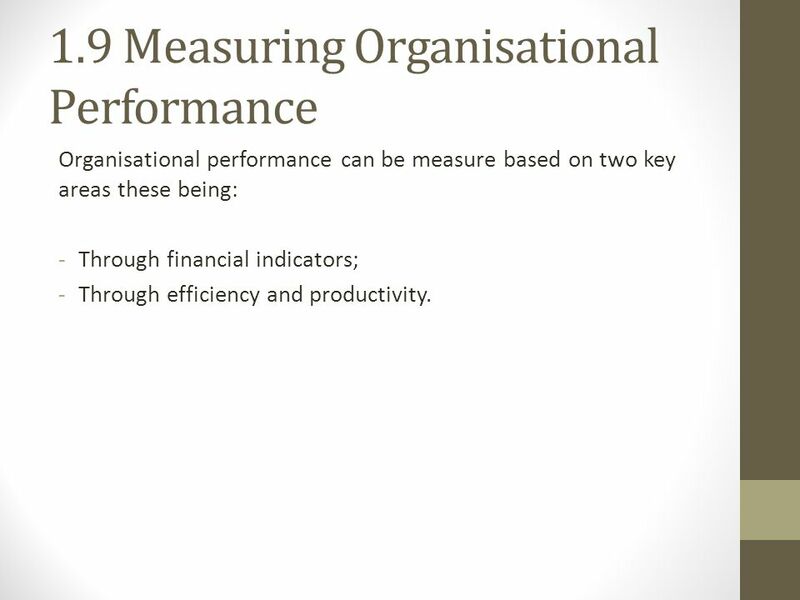 13 1.9 Measuring Organisational Performance Organisational performance can be measure based on two key areas these being: -Through financial indicators; -Through efficiency and productivity. 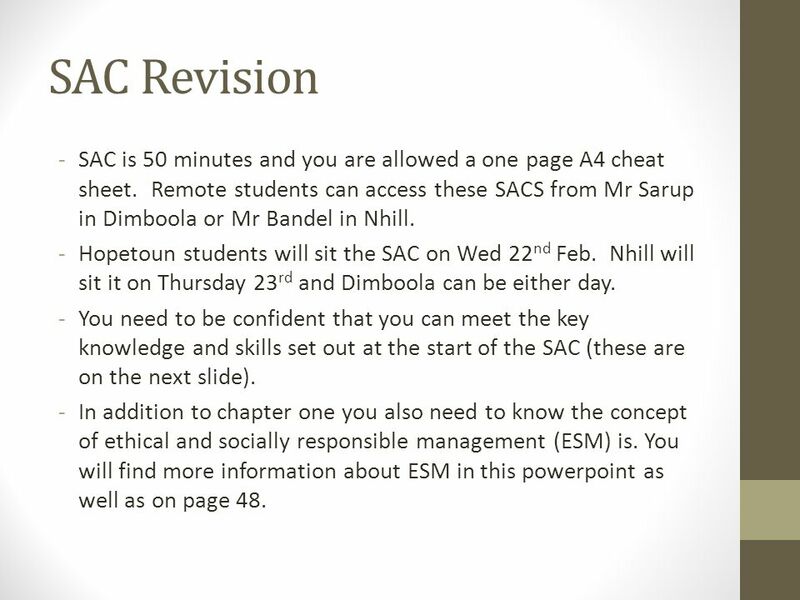 19 SAC Revision -SAC is 50 minutes and you are allowed a one page A4 cheat sheet. Remote students can access these SACS from Mr Sarup in Dimboola or Mr Bandel in Nhill. -Hopetoun students will sit the SAC on Wed 22 nd Feb. Nhill will sit it on Thursday 23 rd and Dimboola can be either day. 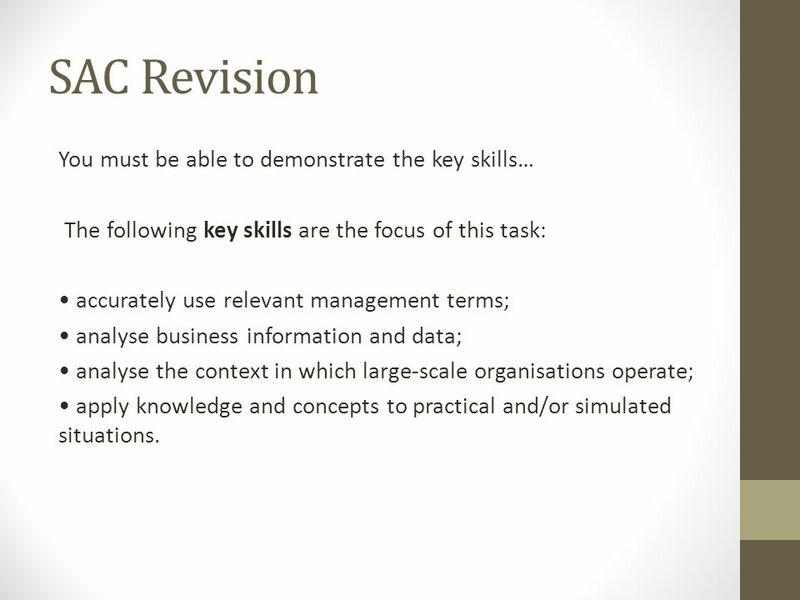 -You need to be confident that you can meet the key knowledge and skills set out at the start of the SAC (these are on the next slide). 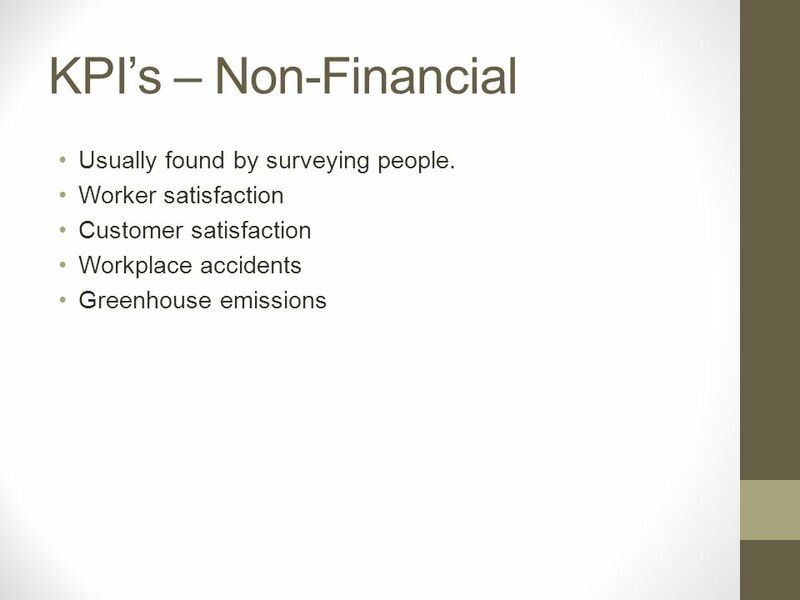 -In addition to chapter one you also need to know the concept of ethical and socially responsible management (ESM) is. 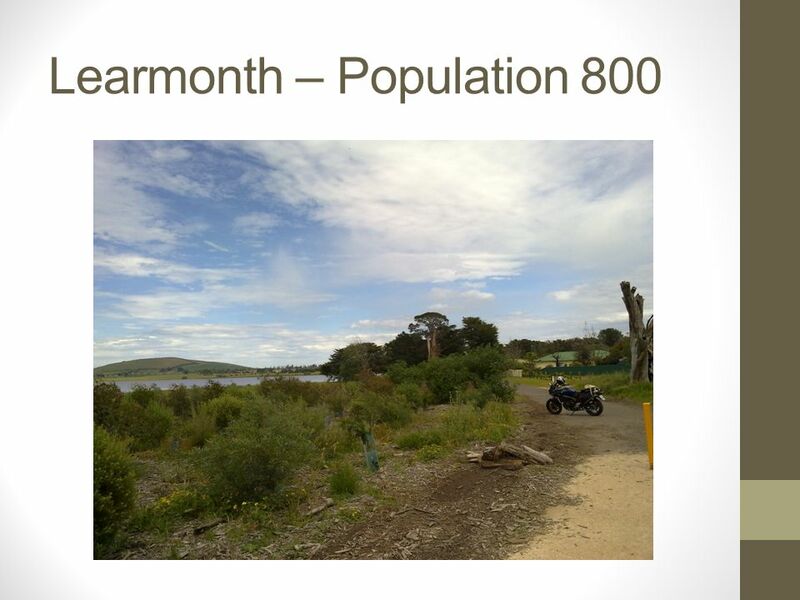 You will find more information about ESM in this powerpoint as well as on page 48. 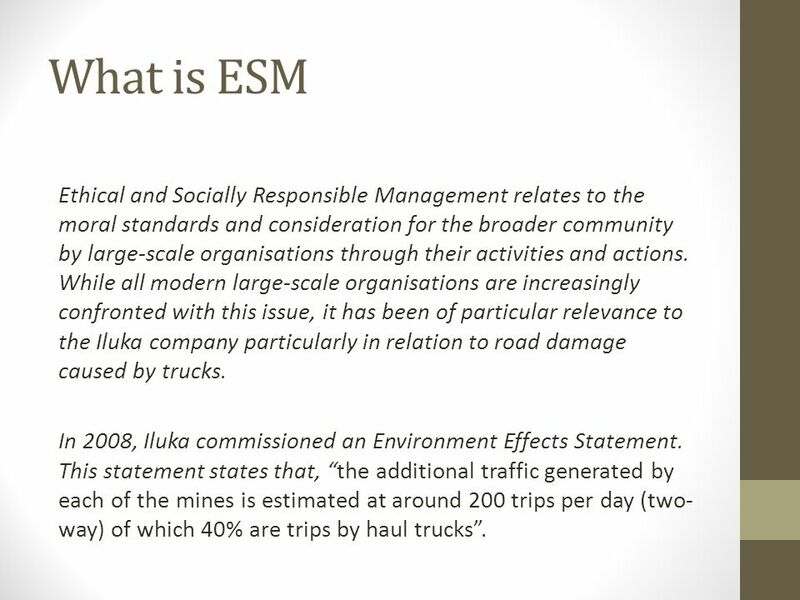 20 What is ESM Ethical and Socially Responsible Management relates to the moral standards and consideration for the broader community by large-scale organisations through their activities and actions. While all modern large-scale organisations are increasingly confronted with this issue, it has been of particular relevance to the Iluka company particularly in relation to road damage caused by trucks. 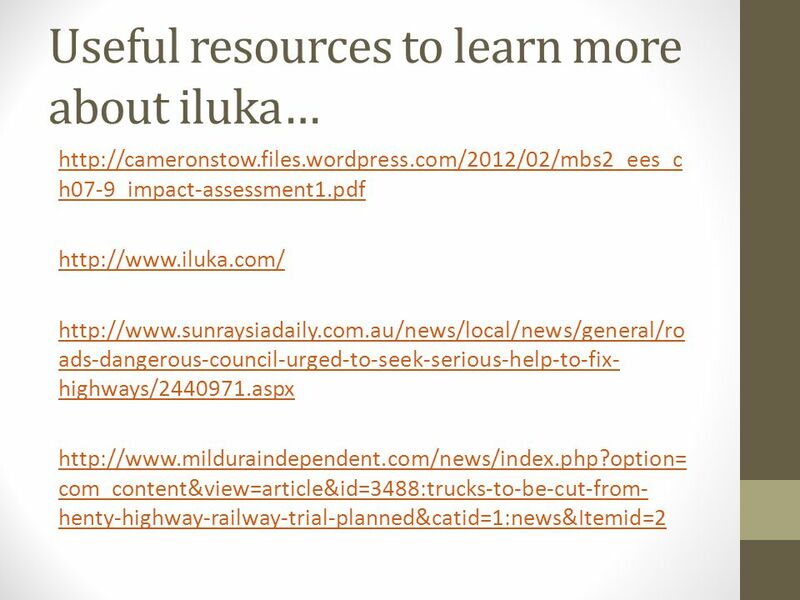 In 2008, Iluka commissioned an Environment Effects Statement. This statement states that, “the additional traffic generated by each of the mines is estimated at around 200 trips per day (two- way) of which 40% are trips by haul trucks”. 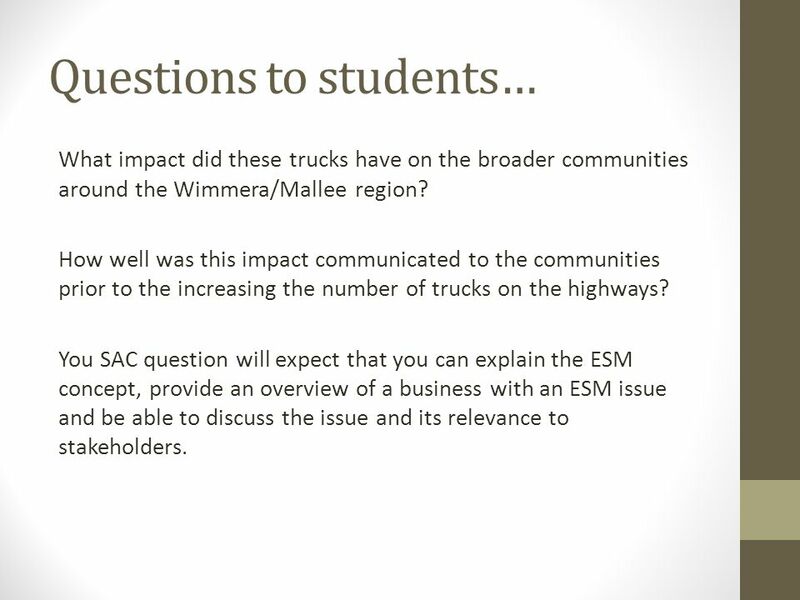 21 Questions to students… What impact did these trucks have on the broader communities around the Wimmera/Mallee region? How well was this impact communicated to the communities prior to the increasing the number of trucks on the highways? You SAC question will expect that you can explain the ESM concept, provide an overview of a business with an ESM issue and be able to discuss the issue and its relevance to stakeholders. 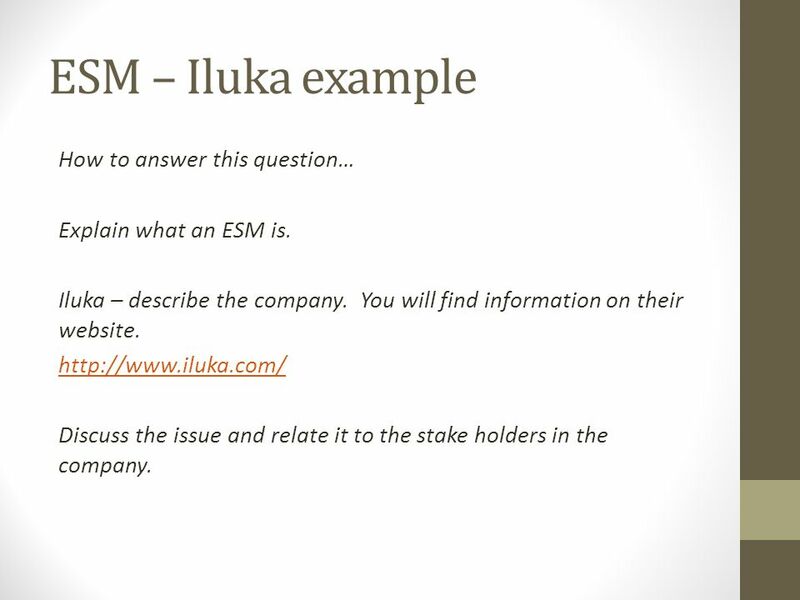 22 ESM – Iluka example How to answer this question… Explain what an ESM is. 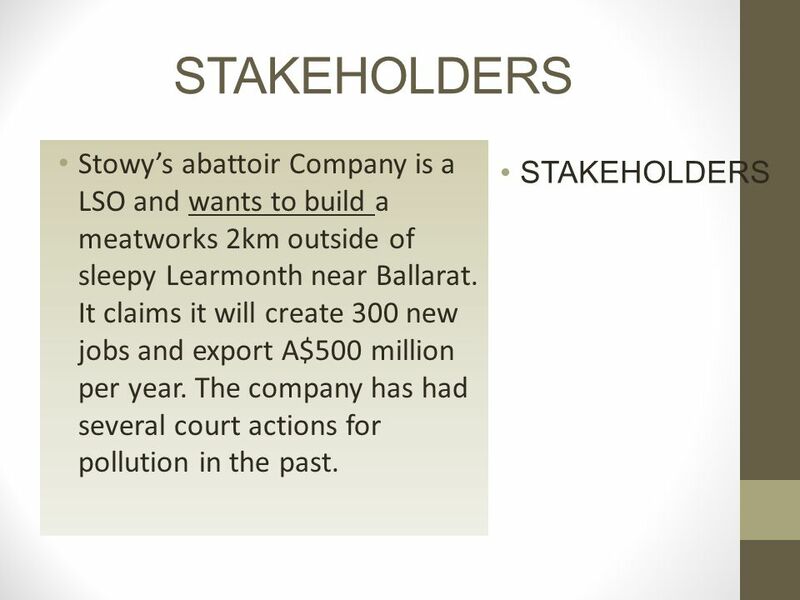 Iluka – describe the company. You will find information on their website. http://www.iluka.com/ Discuss the issue and relate it to the stake holders in the company. 24 SAC Revision This SAC should have no surprises. Check points for success… YOU MUST KNOW THE KEY KNOWLEDGE characteristics of large-scale organisations; variations in types of large-scale organisations, their objectives and related business strategies; contributions, both positive and negative, of large-scale organisations to the economy; internal and external (operating and macro) environments of large- scale organisations; performance indicators used to evaluate the performance of large- scale organisations, identification and characteristics of stakeholders of large-scale organisations, including their interests, possible conflicts and related ethical and socially responsible considerations. 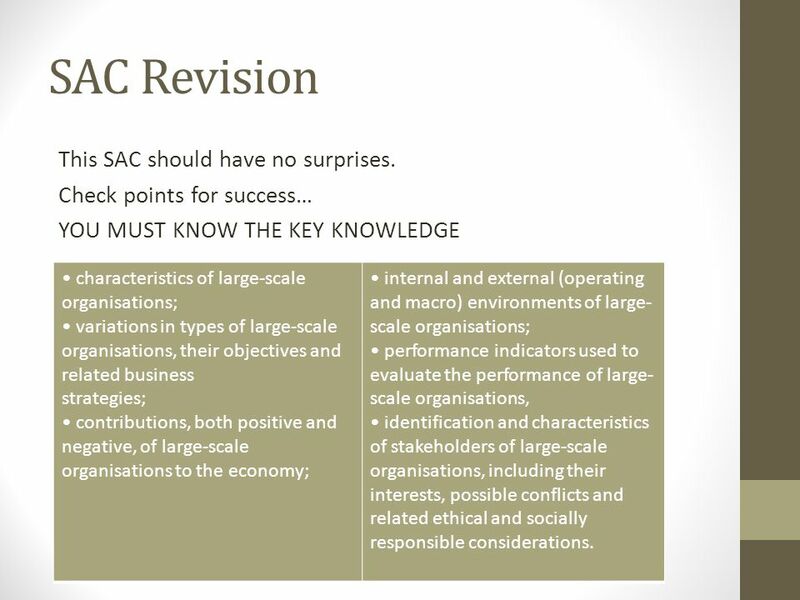 25 SAC Revision You must be able to demonstrate the key skills… The following key skills are the focus of this task: accurately use relevant management terms; analyse business information and data; analyse the context in which large-scale organisations operate; apply knowledge and concepts to practical and/or simulated situations. 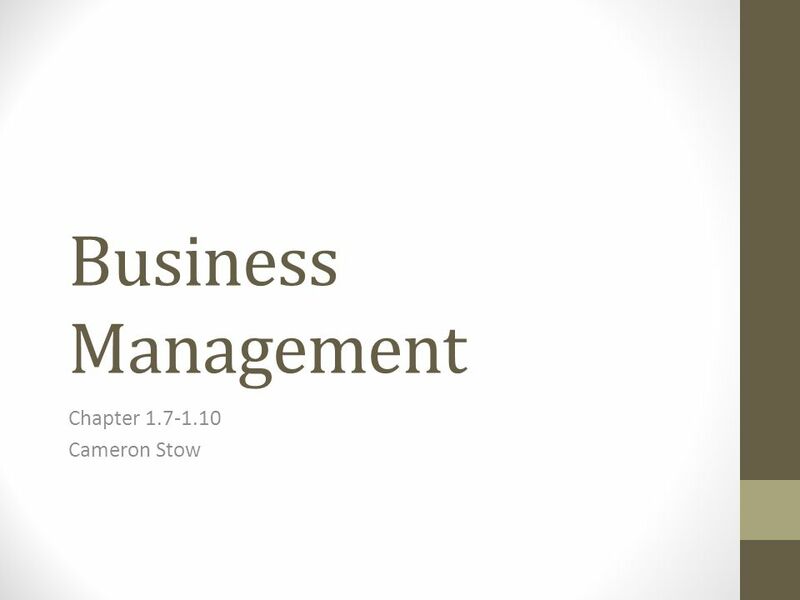 Download ppt "Business Management Chapter 1.7-1.10 Cameron Stow." 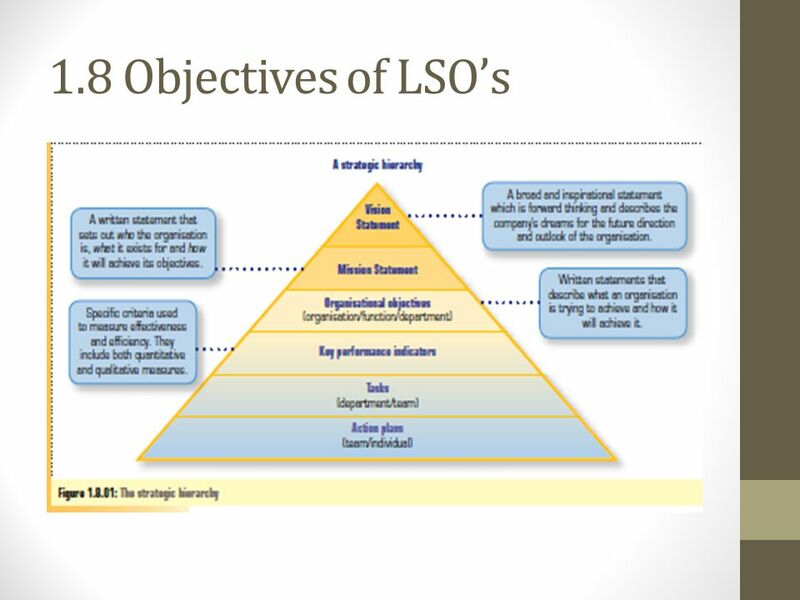 Ownership Structure of LSOs Business Management. 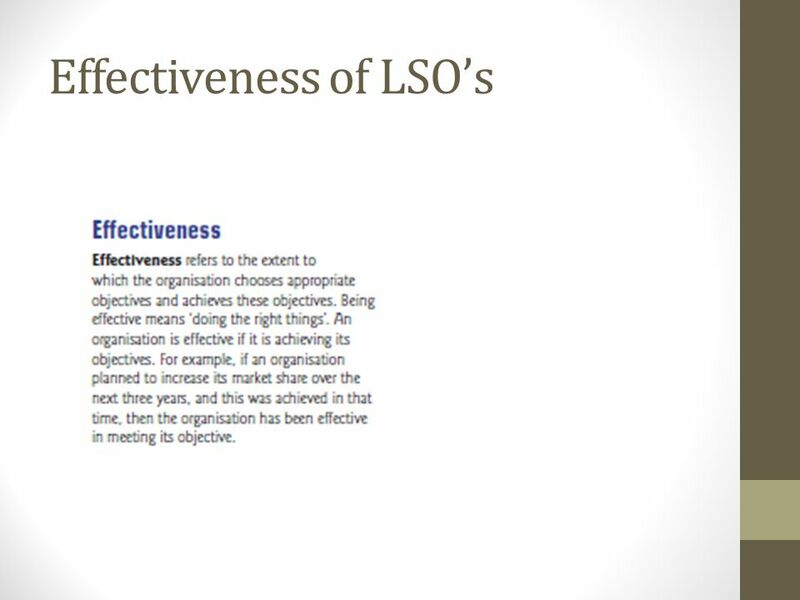 LSO’s Definition Characteristics (how to identify them) How to distinguish between various kinds of LSO’s. BUSINESS MANAGEMENT WORKSHOP 2012 Hopetoun P-12 College Presenter: Cameron Stow Session Two. Copyright ©2004 Pearson Education, Inc. All rights reserved. Chapter 14 Stock Analysis and Valuation. 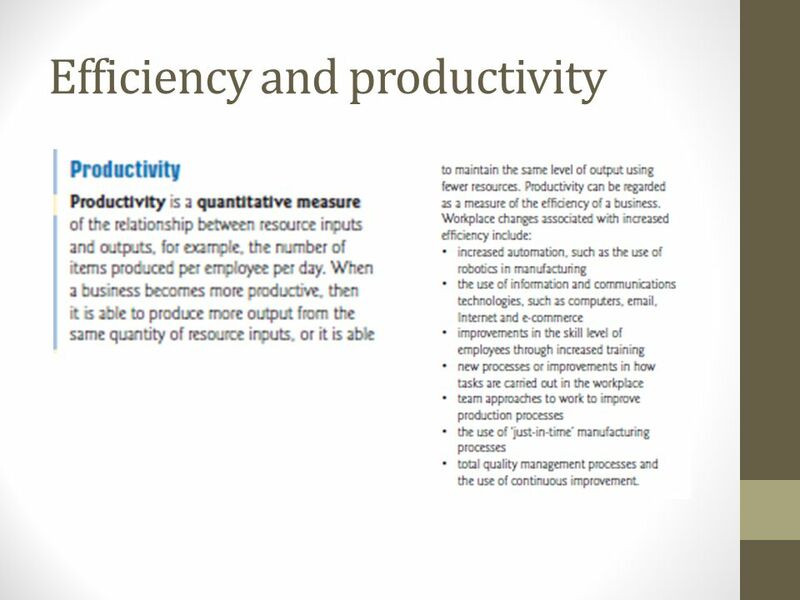 Copyright  2007 McGraw-Hill Australia Pty Ltd PPTs t/a Macroeconomics by Jackson and McIver Slides prepared by Muni Perumal 4-1 Chapter 4 Australia’s. Micro and Macro- the difference? INTRODUCTION VCE BUSINESS MANAGEMENT Hopetoun Secondary College Nhill College Unit 3 – Corporate Management © Peter Frances Hughes 2012. 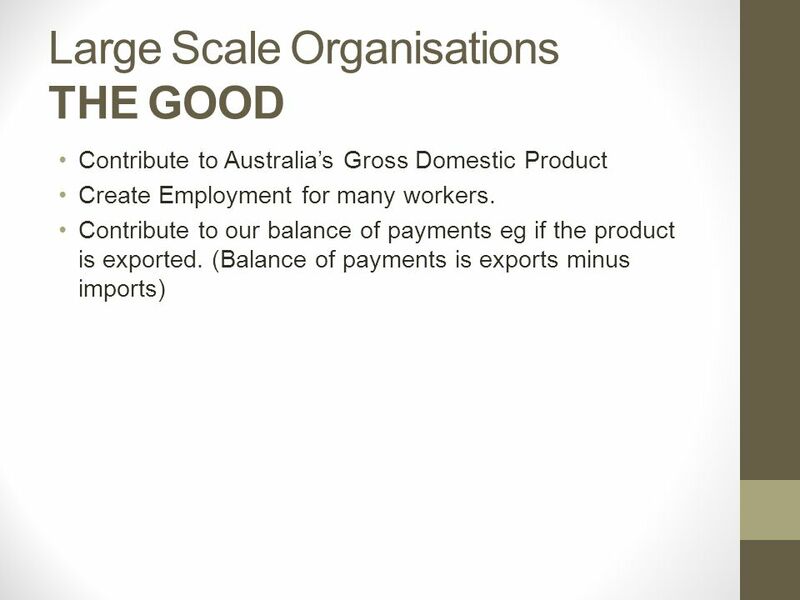 Contribution that large-scale organisations make to the economy. 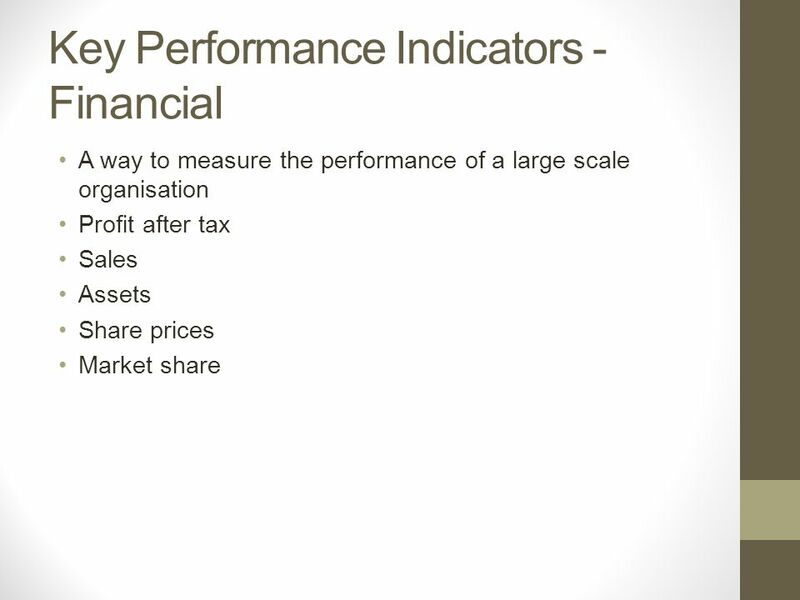 Performance Indicators Business Management AOS 1: LSOs in Context. 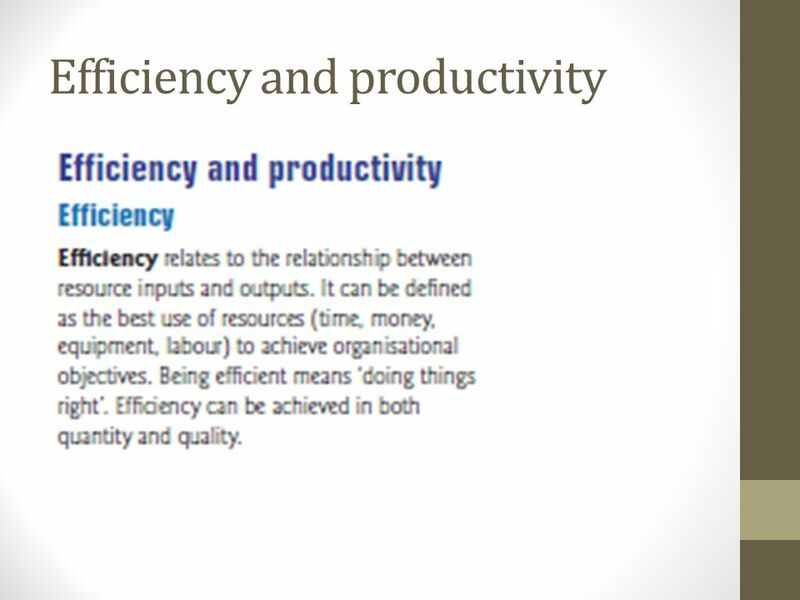 © 2013 Cengage Learning. All Rights Reserved. May not be scanned, copied, duplicated, or posted to a publicly accessible website, in whole or in part. HOW DO SMALL BUSINESSES OPERATE Business Objectives. Accounting and Financial Reporting Back to Table of Contents.